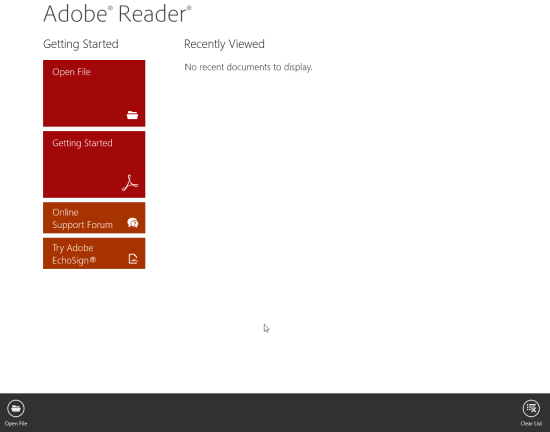 The official Adobe Reader app for Windows 8 is a must to have on your machine to access PDF files with ease. It is free and probably the simplest online application for viewing PDF files in a highly convenient manner. Here, you can view the PDF file in ‘page’ or ‘continuous’ mode. Also, it supports searching for text within the file. On launching it for the first time you will be presented the interface as in screenshot below. Now, the foremost task will be to load a PDF file. For that you will require to click on the ‘Open’ file button placed on top-left section of the interface. Alternatively, you can utilize the ‘Open file’ button on the horizontal bar. Next, you will be prompted to select an existing PDF file on your PC. On doing so, the selected PDF file will load in no time. Now, you can activate the horizontal bar and click on ‘View Mode’ button to select either of ‘Page’ or ‘continuous’ options. Adjacent to it is the search button; on clicking it a small textbox will emerge on the screen to enter the keyword/phrase to be searched. Also, you will experience a change in the interface i.e. two arrows will populate in the right-section of the horizontal bar for finding the next and previous occurrence of the text being searched. * You must understand that Adobe Reader app for Windows 8 (metro) is quite basic in comparison to its desktop counterpart. It has been designed and developed primarily for touch-enabled devices. It works fine with mouse and keyboard as well. Also, check out our posts on RSS Reader Apps, PDF Reader Apps, and Barcode Reader Apps. 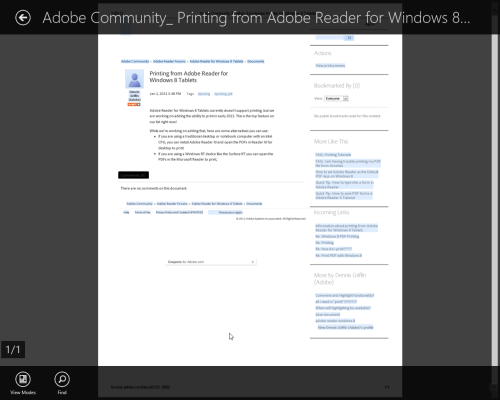 To install Adobe Reader app for Windows 8, you will require opening this link in Internet Explorer 10 or advance. Then click on ‘View in Windows Store’ button to the top-left section of the webpage. Finally, click on ‘Install’ button after being redirected to application overview window in the app Store. Looking at the overall performance, I have no issues in recommending Adobe Reader app for Windows 8. Still, it might not prove a good option for you to read large PDF files with lot of content. The option to print PDF is missing.